All over North America birders and even more specifically, hawkwatchers, are beginning to congregate at sites all over the continent to witness spring raptor migration. For those that have never been to a formal hawkwatch or even a local spontaneous one, I have to say you’re missing a wonder of nature that will for sure enrich your life experience. But what is it about standing on a ridge top or an open field with the wind blowing smack into your face while scanning the sky or starring out over the horizon waiting for something to appear that appeals to so many? Sometimes these specks on the horizon never get closer, sometimes they do. Some go unidentified, much to the frustration of the observer. While many pass directly overhead allowing stellar looks with “oohs & aahs” sounding out! In this Part One of my “For The Love Of Hawkwatching” posts, let’s examine a typical scenario. In the lower right hand corner you see a hint of shape, but can you even tell this is a hawk? And not another bird? What kind of bird? This is when it becomes fun for those not only entering into hawk watching for the first time, but even more so the seasoned veteran. It happened to me over 20 years ago and to this day it’s still a challenge. Sure, the bird will be moving and offer more clues but sometimes even at that you aren’t offered much more to see and judge from. But what can you see in this tiny little shape? Well, for one you can tell it’s holding its wings level to a bit downward. You can also get some degree of proportion of the body to the wing length. Believe it or not most experienced hawk watchers can pretty much begin to narrow down what this bird is just from that shape alone! Incredible? No, just part of an amazing journey in raptor identification!!! Now look at the second image from the lower right. Now we can see a bit more. We see what looks like dark wingtips and a darkish chest. And if you look closely, that darkish chest gradually gets a bit lighter and then dark on the tail. Is that something to note? Maybe, maybe not. But it is this type of close observation that will develop the skills you will rely on later as you progress down this path. And don’t the wingtips appear to be somewhat pointed? Is that enough for most observers? Maybe it is, maybe it isn’t. But what is evident is that a few more clues develop as the bird get closer. Overall proportions get a bit less attention while plumage features get a bit more. Now go to the third image from the lower right. We can see a lot more here, whitish throat, black wingtips, stout body shape and faintly marked underwings. Here most experienced birders are fairly certain what they’re seeing. Maybe. Can this image be mistaken for something other than what it is? I think when the mind starts to drift it has a tendency to lock into something that’s hard to remove. So the key is, don’t let it!!! And finally the last image in the upper left corner. Clearly this image shows all or most of the field marks of an adult Broad-winged Hawk. The broadly banded tail, the heavy barring on the upper body, the whitish throat area, the faintly marked underwing . . . all of which become very evident. When the bird is this close, shape may be the last thing you look at, but don’t let it drift too far away in your observations regardless of how close the bird is. So, what am I trying to say here? Well, just that hawkwatching comprises so many elements. The very far off birds where pretty much only shape and flight style offer any clue as to what it is. Then as the bird approaches a different set of visual impulses come into play. Shape and possibly flight style slowly becomes less focused or relied on and plumage becomes more so. So from the furthest image to the closest image you will experience all kinds of sensory experiences and judgements. And from those things, over the course of time you will become an experienced observer. But, be careful, mistakes are made even on the simplest birds and even by the most experienced hawkwatchers. So, get out there to a place where raptors are seen migrating and experience one of the joys of life you may never forget . . . and do it often!!! 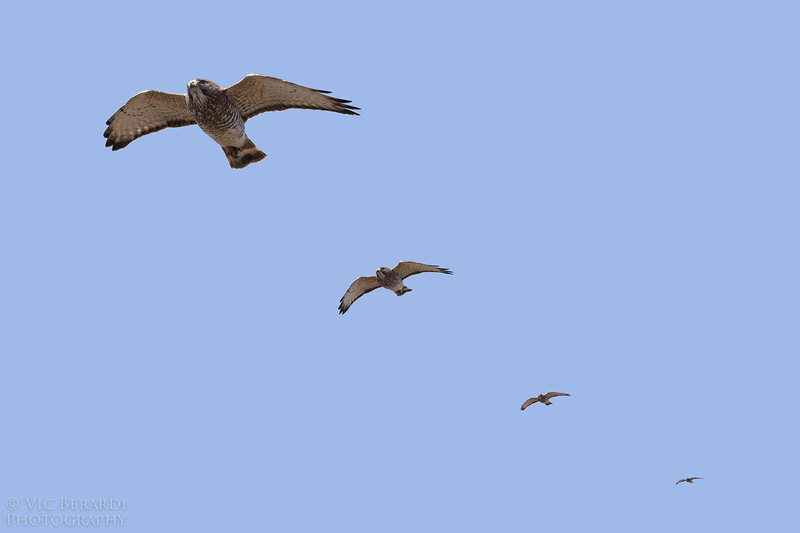 My next post will include some references of places to go this spring, websites pertaining to hawk watching and raptor ID publications to study from. Can you help me identify this raptor (see link) ? juvenile ferruginous hawk (my intuition) or juvenile red tailed ? you can reply at gabriel_normand@yahoo.fr if you wish. Your enthusiasm is contagious! I want to learn more. I love the phenomenon of migration the most about watching hawks! We are lucky a migration takes place every spring and fall, it is the best activity to watch! Thanks Jerry! Yes, very lucky we get to see it twice a year!! Perfect timing for this topic Vic! What a great post…I really like how you explained what can be taken away with each individual image (within the overall picture). You really have “a special way” of getting people excited about hawk watching. It just comes off so naturally, not preachy if that’s even a word. Big Difference. Thank you Robert!! The beauty of hawkwatching is the simplicity of the mystery. Watching a raptor approach from a distance and keying in on all the ID points is important but not the only benefit. Just experiencing the flow of nature is a wonder in itself. Thank you for your comment Debra! I love Brockway, started going there in 1999 and was the only person hawkwatching. Was that way for years, then friends would join me which made it even nicer. Glad an official count is now present at Brockway and hope to get back there soon!! Thank you, Vic! Wanted to mention several sites here in NY along Lake Ontario that you might know about. Braddock Bay is NW of Rochester — http://www.bbrr.org/ — and Derby Hill — https://www.facebook.com/DerbyHillBirdObservatory — is NNW of Syracuse.